← Take Me Out to the Ballgame and Away from all this Snow! I just looked over my post from last time. It was snowing. Guess what? Snow was in the forecast again this week! So far, we’ve been lucky—if you consider it lucky to be in the midst of a cold snap just when the flowers are peering up above the ground. Just a few days ago I watched the Brewers play at Wrigley Field. Most players had knitted masks over their faces. Long sleeves. The fans were bundled up in parkas. Time for more baseball book reviews. 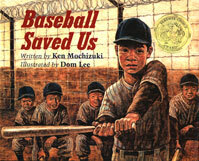 Baseball Saved Us by Ken Mochizuki, illustrated by Dom Lee. Lee & Low Books, New York, 1993. It was 1942 and the United States had just declared war on Japan. The Army rounded up people of Japanese descent, removed them to the middle of the desert and put them into internment camps until 1945. Our government justified this action by saying that they couldn’t know who among them would be loyal to Japan. None of these people were ever proven to be a danger. This theme, fear of “the other,”is the theme of my own middle grade novel, Jingo Fever. In my novel the target of intolerance is German-Americans. Although they were not interred, many of them suffered from prejudice and abuse during the First World War and to a lesser extent during the second. The ingenuity of the adults is nothing short of amazing. They funnel water from an irrigation ditch to make the baseball field. “The water packed down the dust and made it hard.” Somehow, even though there were no trees, they find enough wood to make bleachers. Bats, balls and gloves arrive in the mail from friends back home. The women make uniforms from mattress covers. 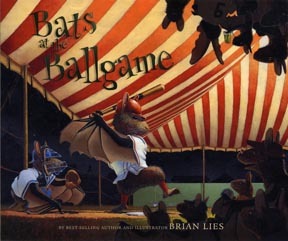 Bats at the Ballgame written and illustrated by Brian Lies. Houghton Mifflin, New York, 2010. “Written and illustrated by…” Every time I see those words on a picture book I am amazed and not a little bit envious of writers who can illustrate their own work. Someone like me, who can barely draw stick figures, fantasizes about painting evocative watercolors to accompany my picture book manuscripts. It’ll never happen. This picture book is nothing short of an ode to the beginning of the baseball season. But of course, that first game of the year may go horribly wrong. When the other team gets the first run and our batters just can’t get it going, it’s time for stories. “Grandbats” tell the youngsters about their heroes from the past. This double page spread features famous ball players – in the form of bats of course – playing out their most celebrated moments in baseball. See if you can guess who each of them represents. This book is just plain fun. Children will enjoy the vibrant paintings of these lovable bats. Adults will appreciate the rhyming style that makes this book an easy favorite to re-read over and over. A portion of the profits of the book is donated to Bat Conservation International.